Today, I purchased a photo at a paper show in Portland. 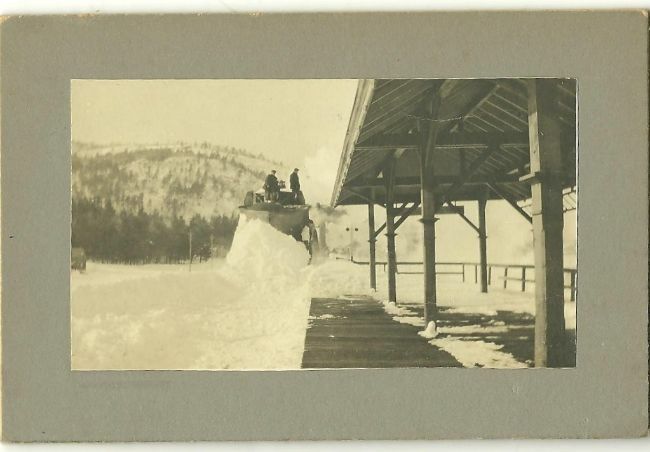 It is of a plow train at Bridgton Junction on the MEC. It is Eastbound approaching the station between the Saco River bridge and the station platform. To the side of the plow, it looks like a ball signal. I have looked for other photos, but have yet to see them in another shot. Anyone know of these? Ok. How about a little photographic evidence. Looking up the MEC Main line, the plow has just cleared the Saco River Bridge. It looks like someone has cleaned off the platform just in time for the plow to fill it up again. But the B&SR side still has snow on it. Ball signals, or what I think are Ball signals, are to the right of the plow. Nice photo Mike. It does look like a ball signal to the right of the plow. If so, the questions are: When was it installed, what did it control (turnout, etc.) who changed it (probably the station agent) and when was it removed? The signal appears to be neutral as neither side is up so why was it in that position? Was this some kind of control for traffic over the bridge if so, what aspect is that? As often happens, a photo raises more questions than it answers. Beautiful shot though with good detail of the platform and canopy. You are right about questions. 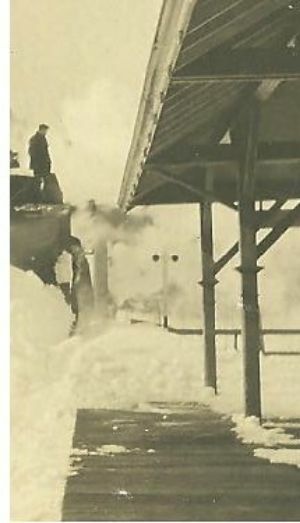 In other photos of the station, there is a semaphore on the roof to alert the train to stop. I wonder if the ball signal pre-dates the semaphore. If the ball signal was an early type of order board there would have been signals at both ends of the station area to alert trains traveling in either direction to get orders from the agent. I've never seen this done although that doesn't mean it wasn't used somewhere. The semaphore style order boards were in use on a number of railroads by 1900. Wish we knew when the photo was taken, it may be from a glass plate negative since the image is so clear. It's difficult to tell from the photo, but the "ball signal" might be just a "Flag Stop Signal" at the end of the platform. Those could be turned to indicate that someone wanted to get on the train at that station. I think the "ball signal" is an optical illusion. I wonder if it's a flanger signal, but it looks too high. (Maybe I've been looking at the smaller two foot signals too much). It would make sense to have a flanger sign before the bridge if there were inside guard/safety rails on the span. I'd buy the "flanger" signal idea. Are there pictures of other MEC flanger signals so compare? I scanned it again, focusing on the questionable post, and then blew it up just a little. Very well could be a flanger post. Kind of high. Still hard to tell. And the original image is hard to tell by. It is only 2 1/4 by 4. I'll research the Mountain Division book for photos of similar objects. Another possibility. A utility pole. Several that I have seen in other photos are painted black (or some other dark color/substance) for the bottom 5 or 6 feet. Above that is either a white wash or clean wood. Could be faded gray. So the dark objects may be transformers. Lights, maybe? Looks like the pole is still on the MEC platform, near the end of it. If the object is electric lights on a pole then there would be a light bulb or two under the platform canopy since the power would have been fed from the station. There are later views that show electric fixtures for the platform. If the lights were kero, the image doesn't look like any kind of lantern or lamp I have seen. The SR&RL flanger signals had a white post with a black base. The cross piece (target) had black circles at either end with the ends being rounded off. If the narrow gauge got the signal plans from the MEC and scaled them down then this pole could be the full sized version of the flanger signal. A photo of a confirmed early 1900's MEC signal would help. When I look at the image I see a pole with two black things hanging off a cross arm. The cross arm is really hard to see, and what I am seeing may be an artifact of the steam and smoke. Hence my suggestion that they are lights. The lightbulbs under the canopy could be hidden by cross members or further back under the canopy. I used some high-end resolution enhancing algorithmic software applications to do a CSI-style analysis of the image on a sub-pixel level. The results are quite shocking as seen below.